Are you a Network Architect? Are you a Network Designer? Are you a Sale or a Support Engineer involved with a Service Provider? This Webinar is for you! The global pool of IPv4 addresses has been exhausted in February 2011, APNIC (Asia/Pacific) has already run out of assignable IPv4 address space and RIPE (Europe) and ARIN (North America) will follow soon. Deployment of IPv6 in your Service Provider network thus became a critical business requirement; even if you still have plenty of IPv4 address space, your IPv4-only customers might not be able to access newly deployed content in a few years. This webinar describes the basics of IPv6, deployment considerations in typical Service Provider networks, IPv4-to-IPv6 transition mechanisms, typical roadblocks, and practical first steps you have to take to start IPv6 deployment in test, pilot and production environments. 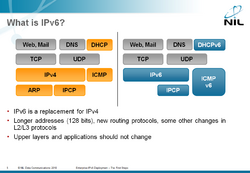 What’s the difference between IPv6 and IPv4? Is IPv6 really better (or worse) than IPv4? Why does IPv6 matter to my organization? Where do I have to deploy IPv6 first? How shall I transport IPv6 across my core network? How shall I connect my customers to IPv6-based Internet? What transition mechanisms can I use? What are the security implications of IPv6 deployment? What do I have to do to prepare for IPv6 rollout? What are the immediate steps I have to take? This section highlights the important differences between IPv4 and IPv6, including neighbor discovery mechanisms (ARP versus ICMPv6 ND/ICMPv6 RA) and autoconfiguration (DHCP versus SLAAC/DHCPv6/ICMPv6 RA combination). It also explains the IPv6 addressing guidelines. This section describes two common core network deployment scenarios – dual-stack deployment where the network runs IPv4 and IPv6 concurrently, and 6PE/6VPE deployment where IPv6 becomes yet another application running on top of the existing MPLS core network. While IPv4 and IPv6 behave similarly in the core network, they use completely dissimilar host-to-router protocols and access network technologies. This section describes common deployment scenarios and design guidelines for PPP-based access networks (including dial up, xDSL and L2TP) and multi-access networks like Carrier Ethernet, cable or PON networks. You have to give access to existing IPv4-only content to new customers even after you run out of global IPv4 addresses. Furthermore, you might need mechanisms that allow you to transport customer’s IPv6 traffic over third-party IPv4 networks (for example, wholesale DSL access). In this part of the webinar, you’ll learn more about NAT444 (also called Carrier Grade NAT or Large Scale NAT), DS-Lite, 6rd and NAT64 (address translation from IPv6 to IPv4). Assuming you’re persuaded it’s time to deploy IPv6 in your network (trust me, it’s past high time), this section will give you down-to-earth tips and steps you can follow to deploy an IPv6 pilot and roll out IPv6 in your production network. You’ll also find out how you can make legacy applications reachable over IPv6 by deploying NAT64 or IPv6-to-IPv4 load balancing. There are numerous other IPv6 issues you should consider, ranging from IPv6 multihoming to network management and security. This section touches most of them and gives you clear guidelines that will help you streamline your IPv6 deployment. If you are a network architect, designer or sales/support engineer working for a Service Provider that hasn’t deployed production-grade IPv6 yet, you simply have to attend this webinar. To attend this webinar, you should be familiar with the basics of IPv4, IP routing and Internet-related protocols (DNS and HTTP). Continuing to enjoy Ivan's webinars, as always very informative covers lots of ground and keeps you interested. Have been using the webinars as a base learning start for major project launches (MPLS & DCI) always good to get a high level view of all options with pros & cons and gotchas to look out for. Looking forward to putting the latest round of learned theory into practice. Off topic, finally deploying the MPLS & VPLS project next weekend, all started from Enterprise MPLS & DCI webinars. My only thought was some of the questions were maybe shut down a little too quickly, not sure if the person raising the question actually got an answer they understood. Almost felt slightly rushed this time.